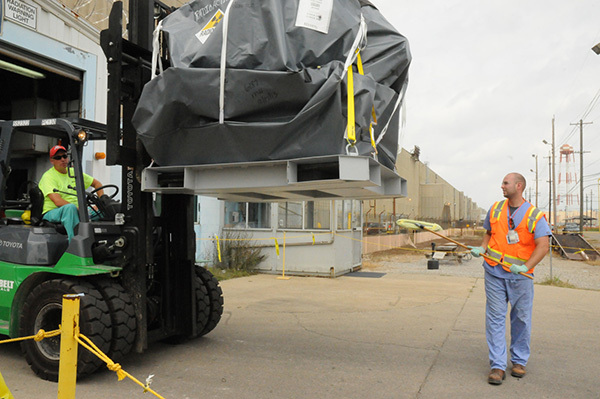 PIKETON, Ohio – The Department of Energy Portsmouth Site and cleanup contractor Fluor-BWXT Portsmouth (FBP) recently finished deactivating the first floor unit of the X-326 Gaseous Diffusion Process Building, a milestone in preparing the cell for demolition. “The levels of skill and effort being invested in this project are showing positive returns as we reach this milestone safely and on schedule,” said Robert Edwards, manager of EM’s Portsmouth/Paducah Project Office (PPPO). Portsmouth/Paducah Project Office Portsmouth Site Lead Joel Bradburne speaks to employees during a luncheon recognizing workers for their contributions to the X-326 deactivation and the unit 25-6 milestone. 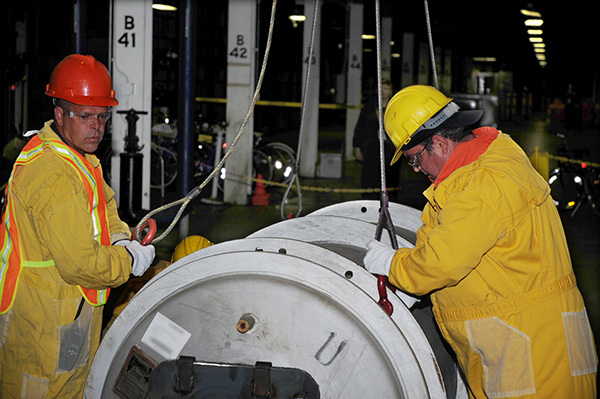 Deactivating a facility involves removing hazardous and radioactive materials, verifying that criticality is not possible, and de-energizing and disconnecting nonessential systems. Deactivation of cell floor unit 25-6 came after five and a half years of work that included improvements to the nondestructive assay (NDA) program. NDA measures the quantities of uranium in pipes and equipment. “Previously, we were doing quantitative NDA measurements, which isn’t necessary in all cases,” said Jeff Stevens, FBP’s deputy project manager. Covering more than 30 acres, the two-story X-326 is one of three massive Portsmouth buildings used for uranium enrichment for national defense beginning in 1954 and later for nuclear energy purposes until 2001. A unit in the building contains 20 cells, each of which includes 12 stages containing motors, compressors, converters and coolers. FBP Process Building Deputy Director James Miller said the team surgically removed components and equipment from unit 25-6. 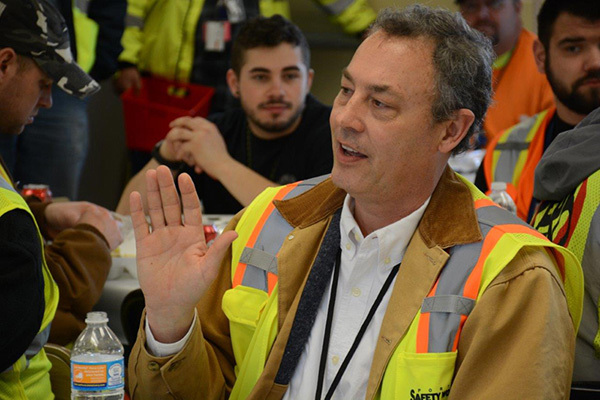 “Significant efforts during pre-job planning and excellent coordination among the multidisciplinary team ensured timeliness and superior safety performance,” Miller said. Focus shifted to characterizing the building’s remaining bypass and auxiliary equipment after workers safely finished removing more than 7,000 components of process gas equipment in 2016. PPPO Portsmouth Site Lead Joel Bradburne said EM is balancing resources between X-326 and X-333 while sequencing deactivation, demolition and waste disposal. 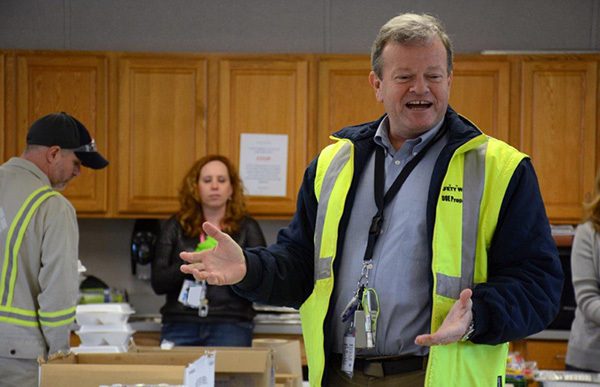 Fluor-BWXT Portsmouth Site Project Director Dennis Carr talks with employees during a luncheon recognizing workers for reaching the X-326 unit 25-6 milestone. Technicians survey packaged components exiting X-326. Workers in the X-326 building package a component for shipment.